Glide-Line’s Direct Product Handling Conveyor and its ZP Conveyor for Appliance Handling are zero-pressure zoned conveyors designed to handle appliance parts or products directly on the conveyor belt (with no pallet on the conveyor system). These conveyors are built for fragile or delicate products and utilize a high friction surface on the conveyor belt to prevent the products from slipping. Further, these are designed to be used in a zero pressure drive method to maintain maximum control over the product motion through an automation process: no touching, no damage. The ZP Conveyor for Appliance Handling is specifically built to accommodate large, delicate products placed directly on the conveyor. The conveyor belt is high friction and has a soft durometer to prevent scratching products. Since this ZP conveyor control concept is designed to prevent products from sliding on the conveyor belt, there is no relative movement or wear between the conveyor belt and the product. 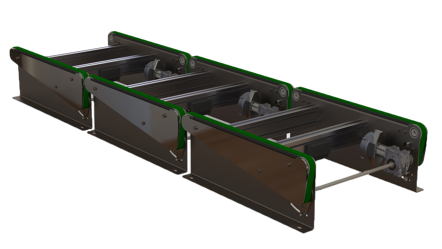 However, the biggest differentiator for the ZP Conveyor from our competitors’ solutions is it can support heavier product loads than a traditional belt conveyor and is significantly gentler on product faces than a roller-chain conveyor (typically used for heavier loads). The ZP Conveyor is a more elegant and cost-effective solution. Glide-Line’s ZP Conveyor for Appliance Handling is a standard Zero Pressure zoned accumulation concept, but utilized with an end-driven conveyor instead of our standard center drive. This allows us to use a belt that would normally not work well with the back bends required in a center-driven conveyor. 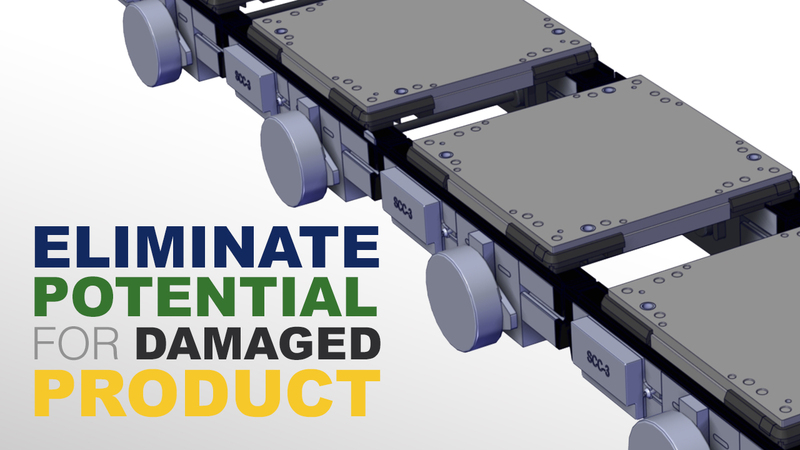 Clients with heavy loads appreciate this solution, since it prevents high wear and tear and eliminates potential for damaging products. 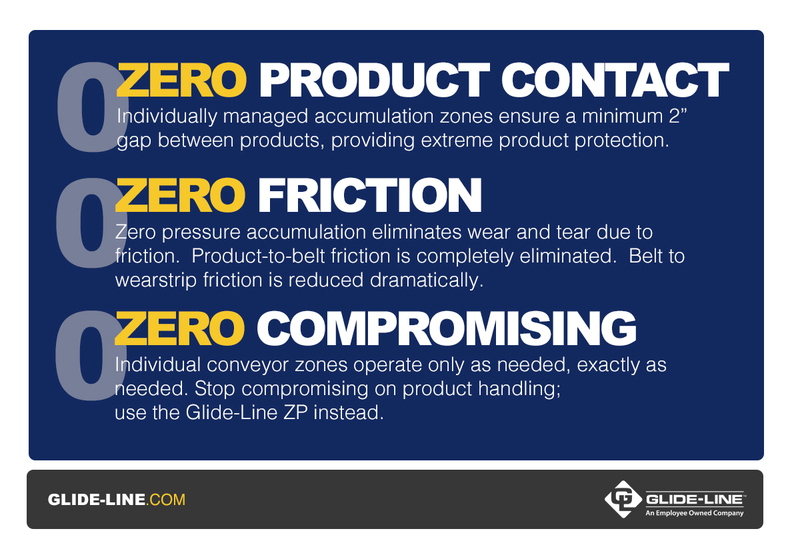 Both Glide-Line’s Direct Product Handling Conveyor and its ZP Conveyor for Appliance Handling are designed to minimize or eliminate product damage, thanks to the design of a high friction, “soft” durometer conveyor belt. The belt was specifically selected for its low durometer rubber coating to provide high friction and give for handling products. 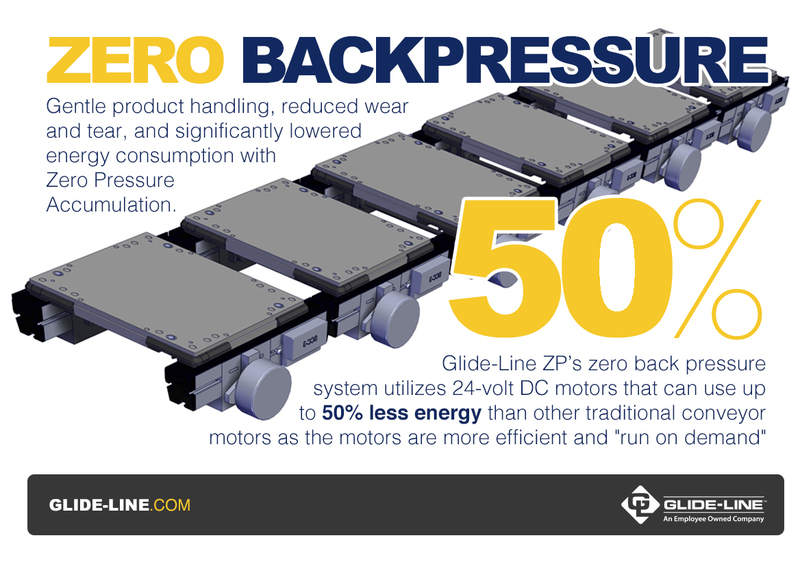 With Glide-Line’s new ZP Zero Pressure Accumulation Conveyor, motors only run when a product approaches and has a permissive from downstream, maintaining a gap between products so no back pressure is created. Accumulation zones are powered by a 24VDC brushless motor and each can handle loads up to 200 pounds. The 24 VDC motor has the added benefit of reducing conveyor energy use by up to 50%. With traditional conveyors, motors often run continuously, creating unnecessary wear and tear on the entire system and continuously running the conveyors, wasting energy. This is not the case with the Glide-Line ZP Conveyor and Direct Product Handling Conveyor, since the motor runs intermittently as conditions demand. 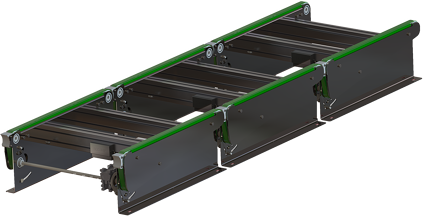 Glide-Line’s Direct Product Handling Conveyor can be built with a higher-than-usual belt profile to handle a slight curvature of the product it’s transporting. The ZP Conveyor for Appliance Handling (a variation on the Direct Product Handling Conveyor) was originally built to accommodate large, heavy refrigerator doors with curved edges. Not only were these doors extremely delicate and easily scratched, but the curved face also presented a challenge normal methods of automation transport could not overcome. Traditionally, our competitors would build a cradle to mount on a pallet. In this case, that wasn’t cost-effective, nor was a second option to build massive pallets. Instead, the client chose Glide-Line’s ZP Conveyor for Appliance Handling, and we were able to give the client exactly what they needed to transport their product. To application designers, the modular design of both the Direct Product Handling Conveyor and ZP Conveyor for Appliance Handling is appealing as well. Adding sections of zero pressure (ZP) conveyor is simple and easily accomplished. Glide-Line’s Direct Product Handling Conveyor and ZP Conveyor for Appliance Handling - both zero pressure accumulation conveyors - are gentler, more reliable, and energy efficient conveyor solutions eliminating 100% of back pressure caused by accumulation. They allow for more control over product handling and significantly lower the risk of product damage for both small products and large appliance products.